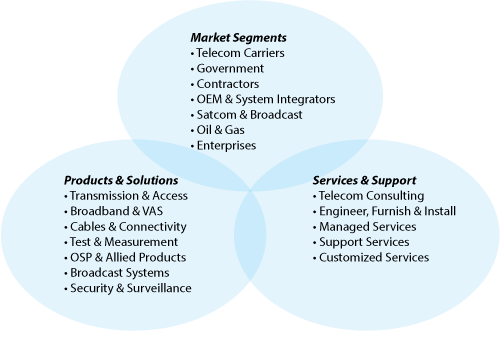 MITTCO’s customer base comprises of tier-1 telecom carriers, government organizations, telecom civil contractors, original equipment manufacturers, system integrators, media & broadcast companies, oil & gas corporations and small & medium enterprises. MITTCO draws strength from the robust partnerships that it enjoys with world’s leading manufacturers of telecom, broadcast and surveillance systems. These partnerships are complemented by the human capital that MITTCO possesses in the form of subject matter experts dedicated to its market segments, products & solutions and professional services. The company’s project references and successful track record over the years have led to satisfaction and retention of its esteemed customers and principals. MITTCO keeps abreast with the fast paced technology developments and offers products and solutions pertaining to telecom transmission & access, broadband & value added services, cables & connectivity, test & measurement, telecom outside plant, broadcast systems and other affiliated products. MITTCO’s modular service offerings are capable of supporting its customers at any stage of their network implementation. Its Services & Support ecosystem is committed to delivering high quality professional services in the areas of telecom & broadcast consulting, network deployment, telecom civil contracting, managed services, turnkey projects and customized services. Team MITTCO is proud to be your telecom, broadcast and surveillance systems partner.